High Stile is the highest of the fells on the lovely ridge that separates Buttermere and Ennerdale, and like most of these fells presents very different faces to the two valleys. The southern, Ennerdale, face, is steep and lacking in features (although some crags do stand out when the clouds are swirling amongst them). The northern, Buttermere, face, is one of the most impressive in the district. On this side a series of ridges run down to the valley, with three coves between them. The bulky northern ridge of High Stile sits between the cove containing lovely Bleaberry Tarn and the rather more impressive Burtness Comb, once a centre of rock climbing. The northern face of the fell is one of the most dramatic sights in the entire district, with a climb of over 2,000ft in three quarters of a mile. High Stile can't be climbed directly from Ennerdale. Instead it has to be approached along the ridge, coming either from Red Pike, which can be reached along a path that leaves the valley near Gillerthwaite and follows Gillflinter Beck for part of the way, or from High Crag via Scarth Gap. The walker from Buttermere has more choices. The fell can be approached along the same ridge, but it can also be climbed via Burtness Comb. The lower levels of this path, cutting up through Burtness Wood, is fairly clear, but it does become a little vague in the comb. The right of way follows the north-eastern corner of the fell, but I found it easier to follow Comb Beck into the heart of Burtness Comb, then cut across the comparatively gentle middle slopes before working my way west to the summit ridge. 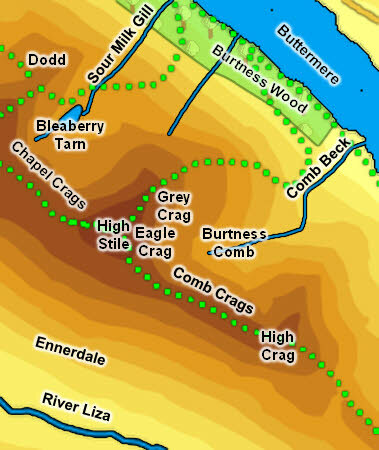 Two of our walks visit High Stile - the first climbs the fell via Burtness Comb and returns via Red Pike and Scale Force, the second comes up the front of Red Pike and then along the High Stile ridge to High Crag and back via the Scarth Gap pass. High Stile is unusual in that it has a fairly large summit area all of which is quite dramatic. The summit takes the form of a gentle curve, with the highest point towards the north-eastern end (over Grey Crag). The high ground then runs south-west before curving to the west, where the second, very slightly lower summit, sits at the top of the climb up from Red Pike. This is one of my favourite summits, with plenty of hidden corners and great views in every direction. The River Liza runs along the southern base of High Stile. A number of small, nameless becks, flow through the trees into the river. Comb Beck runs out of Burtness Comb, and separates High Stile and High Crag. Sourmilk Gun runs out of Bleaberry Tarn and forms the north-western boundary of High Stile. A third beck is formed in the northern face of High Stile. All three of these becks flow into Buttermere, although Sourmilk Gill only just hits the lake, flowing into its western end close to the start of Buttermere Dubs, the outflow from the lake. High Stile can claim half of Bleaberry Tarn, which sits below a line of crags in a lovely cove, and is visited by the many walkers heading for Red Pike.